Calcium carbonate is a common substance found in rocks, shells of marine organisms, snails, coal balls, pearls, nutritional supplements and eggshells. Collagen is found in the flesh and connective tissues of mammals. It is the main component of connective tissue, and is the most abundant protein in mammals, making up about 25% to 35% of the whole-body protein content. 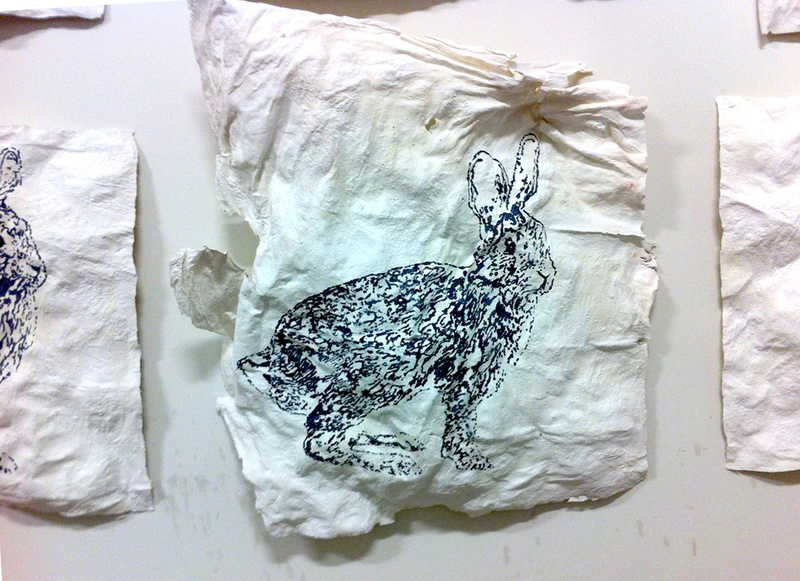 Moving off the canvas developing a material made of rabbit gelatin and calcium carbonate (skin and bone). While drying the material shrinks giving the surface natural folds bubbles and tears. The stencil like replicated drawings of a rabbit are only differentiated by the texture on this delicate eggshell like surface. Each measured copy is unique due to the natural occurring cure. A painting using chew tobacco chaw as medium. Part performance part craft. This painting's use of rejected material tries to beautify this destructive habit forming routine. The beautifully mundane simulated peg board composition is contrasted by this repulsive recycled material. This aesthetic is not driven by design more so by the utilitarian action and a blind attention to committing oneself to a task not enjoyed but one that is endured.